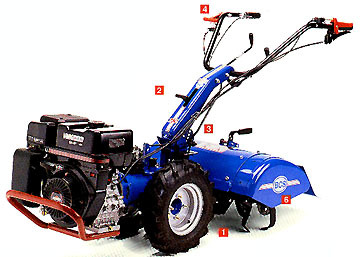 Tines rotate up to 290 rpm's for softer, finer soil, and healthier plants. Handlebars drop for easy turns, and swing aside for walking easily on the untilled path. BCS tillers can be widened or narrowed to meet your tilling needs. It's like getting two tillers for the price of one. Weight is concentrated over the tines for consistent uniform pressure, eliminating the need to push down on the handlebars. All BCS tillers have a geared reverse that allows both hands to be free on the handlebars. Most BCS models offer instant reverse for faster reverse engagement. The exclusive planar wedge breaks up the soil in the center of the tiller leaving no untilled strip down the middle. The all gear transmission and automotive style clutch offer unmatched power, with no belts or chains to replace - ever.